A new report exposing how public private partnerships across the globe including in Colombia have drained the public purse and failed to deliver in the public interest will be launched at the Annual Meetings of the World Bank in Bali next week. 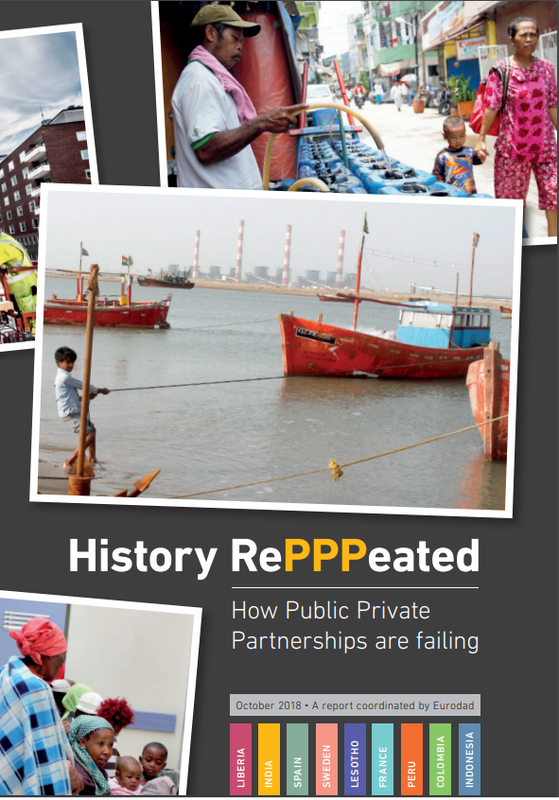 History RePPPeated: How public private partnerships are failing has been written by experts across four continents from organisations including Oxfam and the Centre for Financial Accountability in India. They expose the negative impacts of PPPs that have often caused misery to local communities. The report shows that multilateral development banks, such as the World Bank Group (WBG) have played a leading role in providing advice and finance for PPP projects in different sectors. This is despite the mounting evidence showing that PPPs are expensive, risky and opaque. Maria Jose Romero, one of the report authors and Policy and Advocacy Manager at the European Network on Debt and Development (Eurodad), said: “This report is a serious wake-up call. It is a collection of devastating stories – most of them resulting in national and international scandals in both developing and developed economies alike. The report covers 10 case studies from Colombia, France, India, Indonesia, Lesotho, Liberia, Peru, Spain and Sweden. The sectors investigated include education, health, water and sanitation, energy and infrastructure. • All projects came with a high cost for the public purse, and an excessive level of risk for the public sector and, therefore, they resulted in a heavy burden for citizens. • Nine out of 10 of the projects lacked transparency and/or failed to consult with affected communities, and undermined democratic accountability. • Five of the 10 projects impacted negatively on the poor, and contributed to an increase in the divide between rich and poor. • Three of the PPPs resulted in serious social and environmental impacts. The case studies include the Queen Mamohato Hospital in Lesotho, which is bleeding government coffers largely through huge costs for the treatment of patients; and the case of Jakarta Water in Indonesia, where two PPP contracts resulted in huge losses for the public water utility, while residents often have to rely on groundwater from community wedge wells, or buy expensive water in jerry cans. • Support countries in finding the best financing method for public services in social and economic infrastructure. • Ensure good and democratic governance is in place before pursuing large-scale infrastructure or service developments. • Ensure that rigorous transparency standards are applied. Access the full report including all case studies at: www.eurodad.org/historyrePPPeated or through this link. Photos from the report are available on request. Photos of case studies also available on request. • The report History RePPPeated: How Public Private Partnerships are failing will be launched at: World Bank/ IMF Annual Meetings 2018 in Bali Nusa Dua, Indonesia. Where: Civil Society Policy Forum, Bandung Room. • Since 2004 there has been a rapid growth in the amount of money invested in PPPs in the developing world. Although the trend has been volatile since 2012, efforts by multilateral development banks to leverage private finance in both emerging and low-income economies have continued — for example, through the “Cascade” approach developed by the WBG, whereby the use of private finance is prioritised over public or concessional finance. • This report shows that many projects have been procured as PPPs simply to circumvent budget constraints and to postpone the recording of fiscal costs. Some accounting practices allow governments to keep the cost of the project and its contingent liabilities “off balance sheet”. This ends up exposing public finances to excessive fiscal risks.